I Like Your Wheels—Doctor Who: The Impossible Astronaut (1). Previously on Doctor Who: A Christmas Carol. IN MEMORY OF ELISABETH SLADEN. 1948-2011. Ooh, this is good. This is extremely very good. Almost entirely too good, if I’m honest. Because the Doctor is dead. Of course, before he kicks the bucket, he spends nearly 200 years being deliberately ridiculous, as Amy calls it: he lets a lovely lady paint a portrait of him, almost-naked, hides under her voluminous skirt, completely naked, gets taken prisoner, escapes, and appears in a Hardy and Laurel movie; all to make sure he shows up in some history books that Amy and Rory end up reading. He even goes and does ‘Jim the Fish’ with River, knowing full well he’s going to die. That is cold, Doctor. You know, this isn’t nearly as bad as it looks. Oh, but I think it is, Doctor. Trying to make sense of this episode is like squishing an Adipose—you’ve got one corner, it blobs out of your hand at the other end. Ian Wylie, Mark Gatiss, all the others, they were right: This must be the best series premiere of Doctor Who yet. It’s intricate, it’s complicated, it’s laden with emotions and confusion. In one word, perfect. It’s perfect because it poses the one question I love about Doctor Who, the one question that’s best to wait for an answer to: HOW THE HELL IS HE GOING TO GET HIMSELF OUT OF THIS? First things first: the photography. I don’t think Who has ever been this beautiful. The scene on the beach in Utah? Stunning. The warehouse in 1969? All that darkness, blueish darkness, it’s prettier than what is strictly legal. The acting. It is spectacular. The heartbreak is so real, and while Amy and River’s tears hurt, Rory’s silent expression of grief as he’s standing over the Doctor’s dead body is what really killed me in that scene. It becomes so obvious in that one moment that he really cares about this weird man from Gallifrey, no matter how skeptical he is sometimes. As seen in The Vampires of Venice: he stays, no matter what. And these four actors have upped their game exponentially since we last saw them, they’re acting so well together, the chemistry is sparkling; and Mark Sheppard, ooh, Mark Sheppard, you’re a God amongst men anyway, but this combination is enough to make a girl explode. “I like your wheels”? Mark, I like your face. Anyway, the Doctor we meet at the beginning is 1103, but time has come for him to stop running. This future Doctor has to let the Astronaut kill him—stone dead, this time. 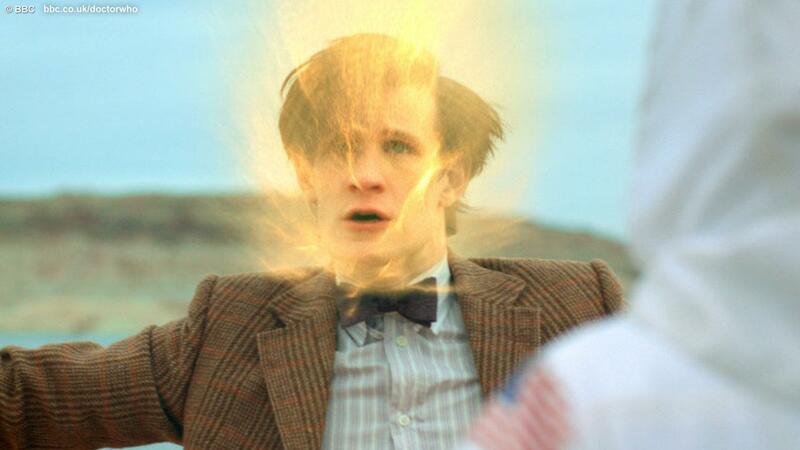 He is shot before regeneration, which means it’s over. Finito. Rory, Amy, River, and an old Canton must watch while the Astronaut disappears in the lake, and then burn the Doctor’s body. And then, they go back to the diner, and there he is. A younger Doctor, 908 years old, with no clue that his older self just manipulated his own past, and that of his best friends, to save himself. A mysterious summons—and who else would the Doctor trust the most, but himself? Except his younger self must not know that he’s going to die, not yet, so what is there to swear on that they’re telling the truth? Swear to me. Swear to me on something that matters. As any decent first part of a two-parter should, this episode has created more questions than there could ever be answers. Let’s start with a few important ones. So, since the Doctor can’t be saved—how are they going to save him? If the Doctor is going to be shot in his future, and River, Amy, and Rory’s past—then what are they going to do once he leaves them at the end of the next episode? Presuming it’s then that he’s going to run off, but I don’t think Moffat would make the Doctor and his companions’ lives another backwards-meeting thing, too, so next episode it is. I mean, they’re not just going to go on, with the Doctor running around for 200 years leaving memories for them everywhere. He’d only take his companions out of their past like this so that later they’d have their hands free to save him. They’re going to have to do everything they can to save him, which is tricky, considering they won’t be able to interact with their own pasts on that beach, or anywhere near. Which, I think, is where the bearded Doctor comes in. Amy says, in the preview for the next episode, that they’ve been looking for the Silence for three months, while being hunted across the country by the FBI (with some insider help and distraction from Canton, mind you). That’s a long time for other things to happen—the Doctor’s being held prisoner at some point, and the BBC site says that he’s prisoner while the others are looking for the Silence. So who’s the Doctor that’s with them in the TARDIS while they explain everything to Canton? He’s not just going to sit there, is he? Also, they’ve got the second TARDIS from The Lodger in that basement, surely they’ll be examining him very closely. Maybe… they’ll try to duplicate him, too. Yes, I know, the dratted clone theory, but it’s the only explanation I can think of why the future Doctor would willingly let the Astronaut—and he seems to know the person inside the space suit quite well—kill him, the Doctor would never just give up. If he makes it through this shenanigans with the Silence alive, he’s not just going to run around for 200 years and then decide to come back and die. Not if there wasn’t a job to be done while running, not if he didn’t think there’d be hope. Ten ran around for months, marrying Queen Bess and causing mayhem, but that was because Ten was selfish and didn’t want to regenerate, not because he saw no hope of survival for himself. Eleven would never just hand it in without preparing an absolutely impossible escape plan first, even if there’s a second version of him somewhere. He’s not sorry because he won’t come back, he’s sorry because of the heartache and the sheer trouble he’s going to cause his friends—has already caused them, from his point of view—with the Silence. So, I think he was being deliberately ridiculous to leave all those trails and traces for Amy, Rory, and River to pick up after he takes off on them, to do whatever they have to do so that the Doctor that dies on the beach isn’t actually the Doctor. Speaking of identity: who’s River Song? River’s in prison because she killed someone. River tells Rory the story of a young girl who meets the Doctor who knows every single thing about her. And River is terrified of herself in that moment, because of what she has to do. Had to do. When I first met the Doctor, a long, long time ago…he knew all about me. Think about that. Impressionable young girl, and suddenly this man just drops out of the sky, clever and mad and wonderful and knows every last thing about her. Imagine what that does to a girl. Trouble is, it’s all back to front. My past is his future. We’re travelling in opposite directions. Every time we meet, I know him more, he knows me less. I live for the days when I see him. But I know that every time I do, he’ll be one step further away. And the day’s coming, when I’ll look into that man’s eyes…my Doctor…..and he won’t have the faintest idea who I am. And I think it’s going to kill me. It’s heartbreaking how she foreshadows her own death there. Now, I’m thinking. There is something she knows about that Astronaut, there must be, because after she tries to shoot it, she mutters, “‘course not,” to herself, as if she should have known. But known what? The way she refers to herself, concerning their first meeting, as a girl… and the Doctor in the Oval Office seems to know exactly who that girl inside the suit is. But even then, it can’t be the young River inside that suit, because her adult self’s reactions don’t match. And it can’t be adult River, because from her current vantage point, that would be a future her, and she remembers what she did, so it’s still in her past. She knows something, though. NOW, THAT’S ALL RUBBISH. I’m leaving it in, of course, but I had it all on backwards. Clearing it up: I was thinking that maybe River is the little girl in the suit, because the Doctor seems to know who that girl is, and because River refers to herself as a girl when she explains their first/last meeting to Rory. But she can’t be, because then she would remember things about the basement and so on, and she clearly doesn’t, so that theory just shot itself to hell. The problem is: I had two events mixed up. The one where she kills whomever she kills and goes to prison for, and the one where she meets the Doctor who won’t know who she is. I don’t know what she means by the ‘worst day that is still coming for her.’ Is it really coming for her, i.e. does she mean meeting Ten in Silence in the Library? Or does she mean ‘coming for her’, as in Eleven will see what she is in his future, but for her it’s in her past? So, depending on what is what: killing the Doctor on the beach—it can’t be the killing everyone was talking about, because she’s already in Stormcage when the Doctor recruits her, so it can’t be an either future or past version of her pertaining to that killing. And I doubt that she takes the place of the little girl to spare her, then there would be a second substantial killing in her timeline, that would just take the momentum out of things. 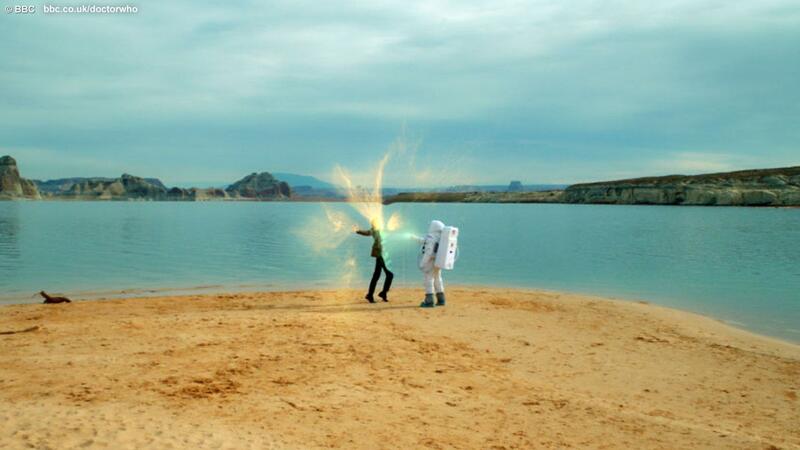 It isn’t the same Astronaut, anyway—Amy shoots the visor, as we can see in the Next Time trailer, and the Astronaut’s visor on the beach is intact. Unless the Astronaut shooting the Doctor is an earlier version of the one they discover in the basement, it’s a new one, and probably another person in there. This is far too confusing for a Sunday morning, which is why I’ll shut up now. Also: thanks for the nightmares, Steven. That is so unbelievably scary and cruel and just absolutely frightening. 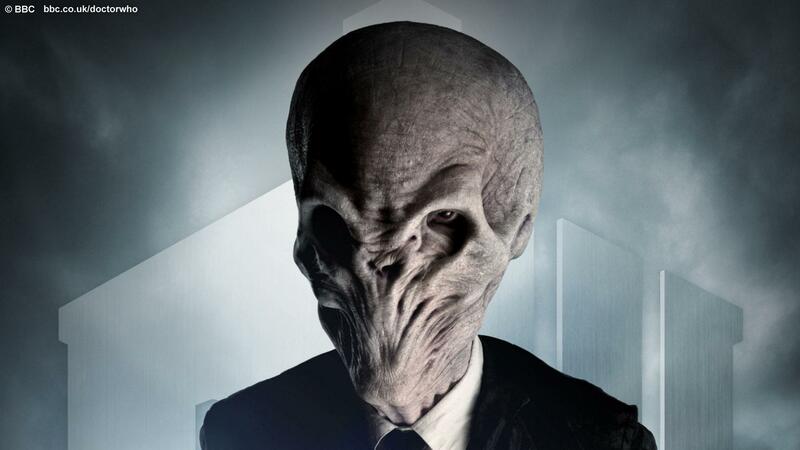 They’ve been running our lives for a while now, the Doctor says—which is why they’re wearing suits, isn’t it? They’ve taken over the people in charge, the people in the shadows, they have become the administration. 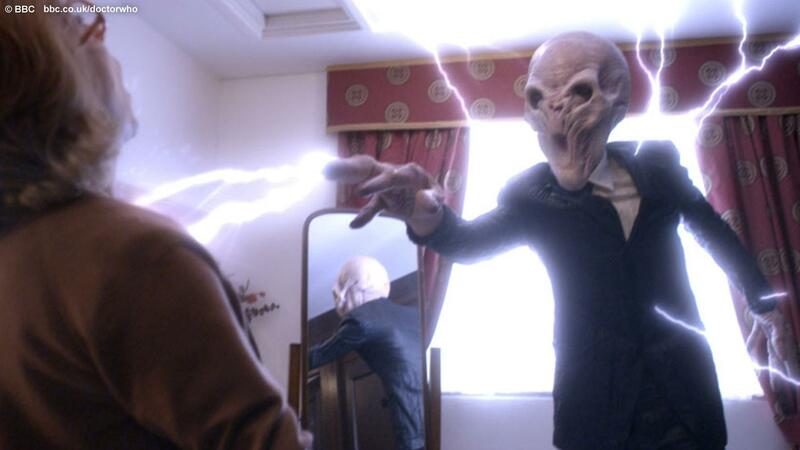 All this talk of “bringing down the government” (The Beast Below) and “leading a revolution”—is there a political angle I’m not getting, Mr Moffat? Good for you! Next episode: Day of the Moon. I’m surprised you didn’t comment on the OMG AMY IS PREGNANT?! and how the hell is Mr. Moffat going to make that storyline work, cause a baby on the TARDIS??? To be honest, I forgot to comment on it in the first place, simply because I don’t think Amy is actually pregnant. The Doctor wouldn’t ever let her stay on if she were (neither would Rory, for that matter); and I think Amy just thinks she is because she feels sick all the time. Since she can’t remember the Silence it’s the first logical conclusion her mind jumps to. River feels sick, too, so it must be the monsters and the forceful forgetting causing the discomfort. Also, the Next Time trailer shows them three months in the future, if she really were pregnant, she’d be showing by then. Ah, I’ve been watching your Doctor Who blog since the fifth series and I thank you for having a post up so soon because this episode was RIDICULOUSLY AWESOME EPIC ASDGHJKLJXACESFDLK *cough* Okay, no, no ranting, because I did actually have something to say. Holy CRAP, I thought the acting couldn’t possibly get any better, but it did…and yes, the Doctor’s death scene almost reduced me to tears. The Silence freaked the hell out of me. They’re about as creepy as the Angels, and that’s really saying something. Just something about that woman turning around every time and immediately going “Back from what, honey?” …God. Chills. On a side note, I actually started watching DW on the fifth series (and promptly became a full-fledged Whovian, thanks so much dad for getting me addicted to this show), and I only just went back and saw Silence in the Library/Forest of the Dead last night–my GOD that was so horrible it almost made me cry. It had much more of an impact because I already know River AND I had heard that story she tells Rory. I knew she was going to die, which was also hard to watch, but I didn’t know those episodes were literally the first time the Doctor met her, just as she was dreading. That was just cruel. Anywho: Yes, Silence in the Library/Forest of the Dead gets worse the more you know about River. They were ridiculously intriguing when I first watched them, but I rewatched after Series 5, and I’m most likely gonna do it again after Day of the Moon, and it just gets better and better–and more and more devastating. AND IF WE DON’T GET AN EPISODE WHERE HE TAKES HER TO THE SINGING TOWERS I WILL BE SERIOUSLY DISAPPOINTED. The Doctor felt he had to make it up to her, somehow, so it should be important enough to be included. “Devastating” is exactly how I’d describe those episodes. It was just so hard to watch. And of course her last word had to be “Spoilers!” Should have seen that coming a mile away, and it’s not really that big of a big deal, I suppose, but still…very fitting. And horrible. And…yeah. Maybe they’ll do a Singing Towers extra or something…I really want to see it too, but if you think about it, that scene is already in the Doctor’s timestream; it’s already over. They just didn’t do an episode on it. It would have been right after Silence in the Library/Forest of the Dead but before the Angel episodes. But again, maybe they’ll do a special. I want to see it too. No problem at all! If you don’t mind my ridiculously long comments I would love to become a regular here~ x3 Looking forward to your next post! Rants are the best thing a fandom has to offer, I find, ’cause they’re usually born out of affection for something, even if it’s an angry rant (not to be confused with mindless hating, though, that’s the worst thing a fandom has to offer). If I rant, I care, which is just what the creators of a show need; without caring fans, the whole thing goes down the drain. It’s downright macabre, for River’s last words to be, “Spoilers!” UGH, MOFFAT. HEARTBREAK EVERYWHERE. I think they could do a special, or even just a tiny flashback in the narrative when the Doctor meets the young River for the first time, it wouldn’t hurt anyone to have that contrast first time/last + penultimate time. And I think it’s significant that they haven’t done anything on that yet, because it can’t have been Ten taking her there, because she hadn’t seen that face before, if I remember correctly. So, must have been Eleven; and think about it, there’s no way of being certain when in the Doctor’s timestream that happened. It could have been an older Doctor plucking her out of the timestream, just like he did with his companions here. Mind, his Screwdriver doesn’t have any red settings and dampers yet, and that’s the Screwdriver he gives her to go to the library. OH DEAR. I AM EXPERIENCING A MOMENT OF CLARITY. What the Doctor said in A Christmas Carol. “It’s this or going to your room to design a new kind of Screwdriver: don’t make my mistakes.” I always thought he was just referring to a missed opportunity in his past, maybe in the Classic series, some tiff with Romana, perhaps, but it could be THAT, designing the one he needs to give to River. Either because he’s already designed it, to give it to her later, or because he’s still got to do it. He blames himself for River’s death, he let her get away, and he doesn’t want Kazran to live through that, too. Well, with all that information, I’d be surprised if we didn’t get that in an episode, as a proper goodbye. I mean, just having the time where she meets him for the first time as a goodbye would be cruel–there needs to be an ep where they’ve done everything, where they both know each other completely, when they go to the Singing Towers. That’s why I think the Doctor wouldn’t do that while he still barely knows her. He’d wait, so that they could both enjoy it. Well, “enjoy.” IT’S STILL COMING. NextSomeone Built the Perfect Prison. Again—DW: Day of the Moon (2).